Welcome to J Cat Custom Glass Studio featuring the art of Janet Zambai. Serving Casper, Wyoming and the Rocky Mountain region. Janet is One of the most versatile artist's in the country. She is able to create works in most aspects of glass, plus fine art paintings in most mediums. contact page for a full listing of contact information including e-mail link. Let us create a unique design just for you! Each of us is differently gifted. As artists, we each have our own unique talents and abilities, and it is our obligation to figure that out. To discover ourselves and what gifts we have received so that we can share those with others. I want my art to be a positive experience, to delight and stimulate the imagination. all need each other. We enhance each others lives. I want my life and work to make a difference in the world in some way. I dont know what that is. I cannot control how others experience my work. I can only present it. I want to do every thing! I think sometimes people are confused when they see my work because of the variety, and the fact that I choose to live in Casper Wyoming. 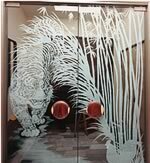 This custom design was sandblasted on clear glass for the interior entrance into a private Casper, Wyoming home. Click photos to enlarge.